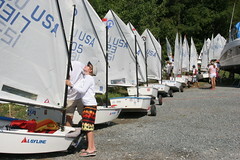 Today was the second day of Green Fleet racing in the USODA Layline Nationals. The sailors have been learning about successful racing strategies as well as how to avoid fouling and when to do 720º turns. Those with little experience are starting to look much more comfortable on the water. Yesterday morning, the Green Fleet stayed on shore after the skippers’ meeting in order to get to know each other and so that Coach Tom Coleman could give them some instruction. He taught them about the five-minute start sequence and made sure they understood the course. Around 12:30 yesterday, and after eating lunch, the sailors started launching their boats. Race Committee, headed by Mark Hayes, set up a triangle course and ran four races. 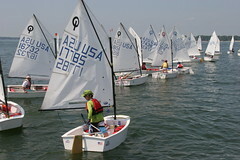 Many sailors displayed strong racing skills. However, coaches were encouraged to help all competitors that were in the back half of the fleet. This morning, the Green Fleet again stayed on shore after the 8:30 skipper’s meeting. Tom Coleman gave the kids a chance to ask questions about the previous day’s racing. He also asked those that did particularly well to share their strategies for the start and the windward leg so that others could improve. He and Mark Hayes both used the session to talk to the sailors about clearing the finish area and the final leg so that Race Committee could see everyone’s finish. Racing began much earlier, with sailors launching their boats around 10:00. Today’s racing was designed to build on the sailors’ knowledge. Courses included the triangle course from yesterday as well as the windward – leeward and the modified Olympic. Green Fleet got in four races today, with a pause in the middle for lunch and swimming. The air was light, which made for good conditions for the youngest sailors and challenged the higher level skippers to get as much speed as possible out of their boats. It has been a great regatta so far for the Green Fleet, and the sailors will hopefully get in a good number of races tomorrow as well. They seem to be having a lot of fun and learning a great deal. For photos from yesterday, please click here. Today’s photos can be found here.